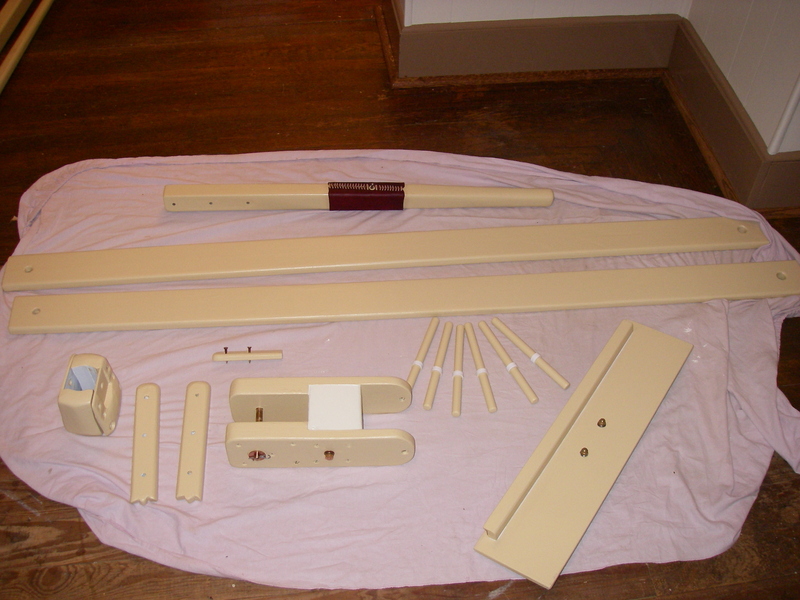 Various parts are laid out on the workshop table. Some are obvious, like the tiller, showing it’s heavily scraped area where it rubs on the movable slide board in the cockpit. The chunky thing in front is cargo boom jaws, explained more in a moment. 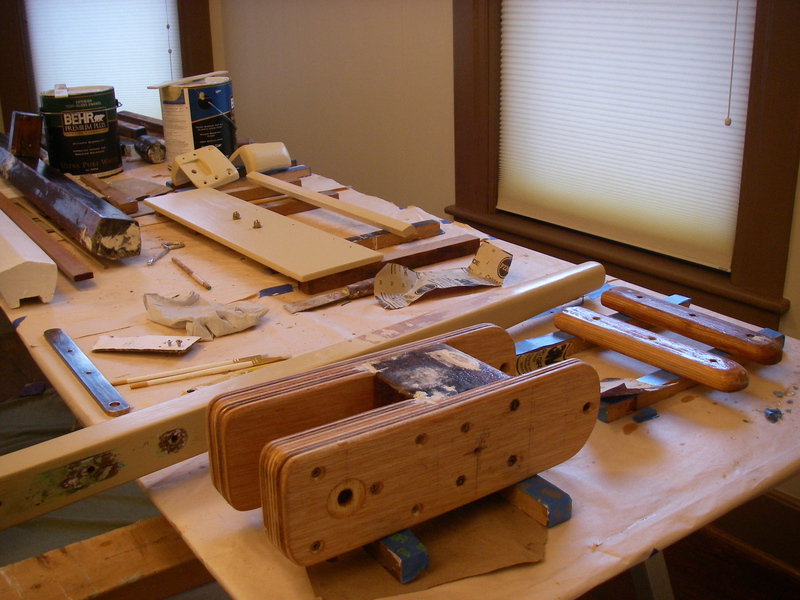 Other odds and ends have to do with the rudder stock repair, and resulting changes in the stock/tiller connection. There is also a short drop board, which has two jobs: holding the bracket for the gimbaled propane cookstove, and new this year, having a proper gasketed lip to make a little barricade for unruly bits of water sloshing toward the interior of the cabin, while underway with no big drop boards in place. At the back left, those are not boat parts – pieces of the house have been patiently waiting their turn. The tiller is finished, and Suzanne and I had some fun setting up a piece of leather and lacing it on, to protect where the underside of the tiller was getting scraped. Leather for this kind of project, which was originally a little bit hard to find, came from The Wooden Boat Store, where it is sold primarily for oar leathers. Off and on they have “scraps” available, at a much more manageable price. We did a similar leather project on the yard last year, where the yard had been getting worn against the mast, and it worked out well. 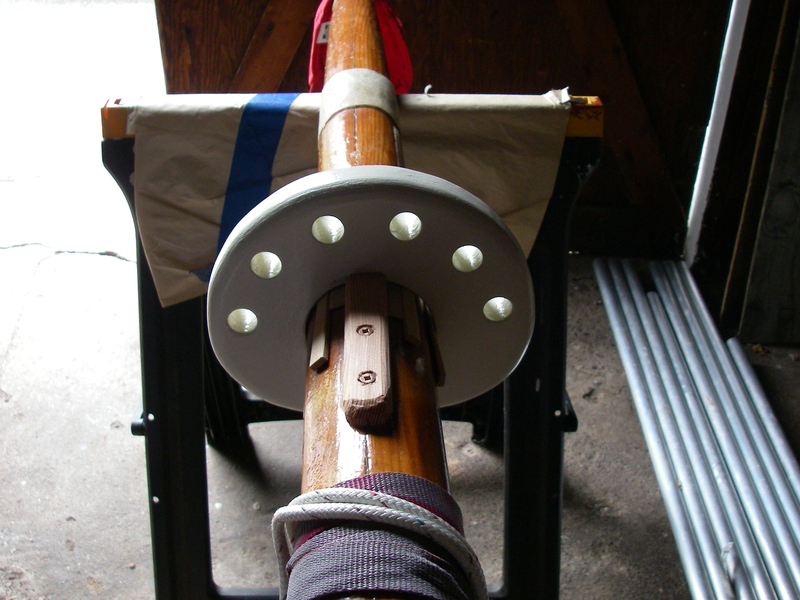 Also new, and somewhat experimental, is the belaying pin collar for the mizzen mast (shown below), to provide places to tie off the numerous junk rig and other mizzen lines. There used to be a big plastic cleat on the mast, held with two screws, which has now been taken off. I’ve been averse to putting more screw holes in the mast, so the collar is going on with wedges, and is braced by that little stop block that uses the old screw holes from the cleat. Seizing will be going around the wedges, to keep them from going anywhere… It all feels pretty firm now, but we’ll see what happens in use. Belaying pins made from dowel, with little tubing stop-collars, will go in those holes. They too are just out of the paint shop, and are shown in the earlier photo. With all this going on, I guess it’s obvious why the boat has not made it to the water yet! But on the other hand, I’m having a really nice time being home for a bit of summer. It’s satisfying to work on this stuff, even if a little alarming to have so many experimental bits running at once. It should make for an interesting month, as the parts get to actually go together. i particularly like you cargo boom scheme. i may try something similar for lifting my 80# anchor… thanks and see you on maine! peace. Here’s hoping all is well with the cat, no longer part of the e-mail name?? Moving an 80 pound anchor does indeed sound like a job for some mechanical advantage. I’ll report on how the cargo boom does on my smaller ones. Would love to hear, if you put something together. Cheers to you both – Penobscot Bay in August? ?